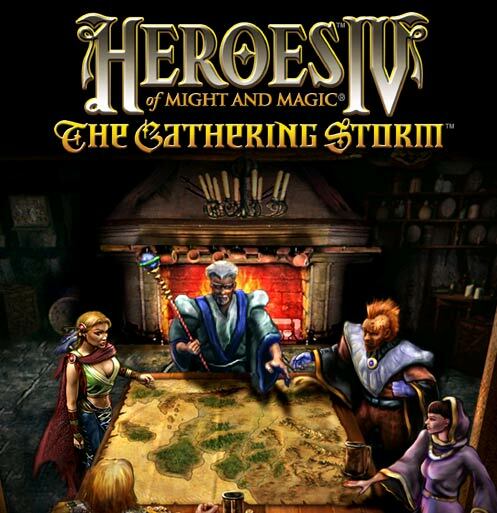 The first expansion pack for Heroes of Might and Magic IV, The Gathering Storm, was made available on the 24th of September, 2002. The main gameplay mechanics of the original game remained, as did the interfaces and graphics style. The Gathering Storm was a smaller expansion when compared to it's Heroes III counterparts, primarily due to the despondent state of the producer, 3D0. Under the circumstances, a sizeable amount of new content was added, predominantly in the Campaigns. In the new Campaigns, Hexis is the crazed Wizard and mutual enemy of your chosen hero. Hexis controls the realms of Death and Nature, and through this power has put the lands of Devonshire and Lodwar in jeopardy. As his power grows, so does the chaos enshrouding the kingdom - floods, earthquakes and other natural disasters become prevalent, and so the story of five heroes emerges, and a plan to stop and reverse the damage already done to their land. Six new Campaigns featuring 22 maps between them, following the adventures of five Heroes who attempt to bring an end to the chaos caused by the Mad Wizard Hexis. 21 new single player scenario maps, including 3 allied maps. There are five new Heroes, all of whom have their own Campaign: Agraynel the Bard, Bohb the Archmage, Kozuss the Wizard, Alita Eventide the Dark Priest, and Dogwoggle the Barbarian. Eight new adventure map objects make their appearances, five Conservatories of Magic (one for each alignment) and two Coliseums (one Might and one Magic), where your hero fights on his/her lonesome against a Black Dragon or a Faerie Dragon respectively. There is also a hidden Dark Castle, the stronghold of the Mad Wizard Hexis. Also included are 16 new artifacts, Ring of Light, Cloak of Darkness, Tiger Armour, Tiger Helm, Frost Hammer, Harmonic Chainmail, Necklace of the Muses, Aiffe's Mandolin, Flame of Chaos, Ice Scales, Necklace of Balance, Archamage's Hat, Staff of Disruption, Wayfaring Boots, Ring of Flares and the Angelfeather Cloak. These artifacts correspond to the new heroes, and, in the right combination, grant the Hero a unique ability. Four new creatures make their debut, (without their accompanying adventure map dwellings) aligned with the towns of Asylum, Academy, Death, and Nature. The Goblin Knight is a level 3 Chaos walker, the Evil Sorceress is a level 4 Order spellcaster, the Gargantuan is a level 4 Nature shooter, and the Dark Champion is a level 4 Death walker. There is an additional music track provided for the Main Menu to accommodate the theme of The Gathering Storm. Thanks to The_Hydra (Heroes 5 Content Admin, Heroes Community Moderator) for the expansion overviews.